The coat of arms is a hereditary code, first borne upon a shield of Kings, Princes and Knights. Such code was for the practical purpose of identification of those who fought in great battles. The coat of arms was vital in tournaments for participants and spectators to identify those who battled well – and in fairytale talk, helped to seek out those knights in shining armour. A common misconception is that a coat of arms exists for each family name. However, this is not the case. Not every family has one of these somewhere in their ancient history. Arms are specific to an individual and passed in the legitimate male line from parent to child. Seen as the perfect status symbol to communicate both wealth and chivalric prowess, it was up to the herald to recognise, regulate and grant the coat of arms. The first documented use of the coat of arms in medieval times is on the Bayeux Tapestry, dating back to the 11th century AD. The piece features knights in battles with shields emblazoned with heraldic symbolism. Today the use of a coat of arms is still tightly regulated, and unless firmly traced back through your family lineage, you may not have the hereditary rights to use the design. The coat of arms became a symbol of identity incorporated into family emblems and was commonplace on Signet Rings. Each crest is unique and personal to the ring holder. Traditionally, the composition of a coat of arms is centred around the shield, otherwise known as the heart of the system. Where the story of the design first begins. Other elements include the crest, referring to the three-dimensional device located on top of the helmet. To either side of the shield hangs the mantling, a piece of cloth often shown ripped or slashed as a result of the action. Many designs today feature the ‘supporters’ either side of the shield, usually two animals that have a part in the origin of your heritage. Below the shield, or above the crest, arms designs started to feature a motto. Find those words of real inspiration to carry with you always. The full ensemble of the shield, helmet, crest, wreath mantling and motto became known as the full achievement. As history tells us, not every individual held a personal coat of arms, so your family lineage may be missing this hereditary code. Don’t let this stop you from introducing such symbolic detail to your jewellery. Anyone can create their coat of arms to use. Why not follow the components of the full ensemble that we have mentioned as a starting point in creating your custom coat of arms. Choose the symbolism that means something to you. 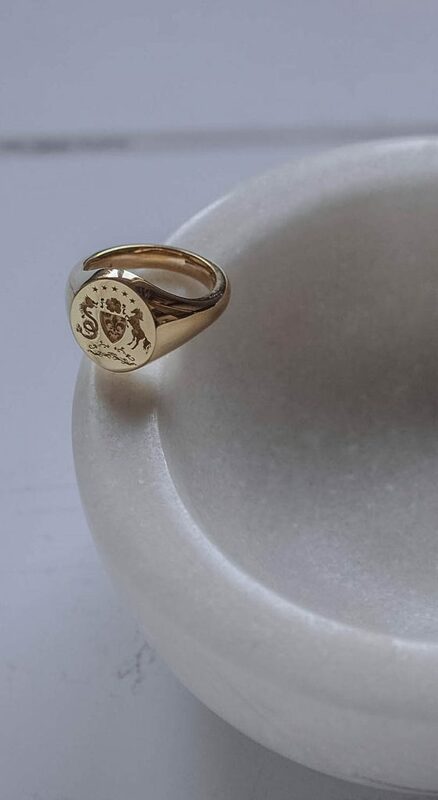 Perhaps think about what you would like to include for each component, and together we can design a beautifully hand-drawn coat of arms to have engraved on a piece of jewellery. So, when did the coat of arms first become introduced on jewellery? History tells us that the people of Mesopotamia used seals and their own coat of arms to mark authenticity, and beyond this, with the arrival of the ancient Egyptians, the seal first became attached to a ring. Pharaohs and other influential people of this era would wear Signet rings to reaffirm their authority. 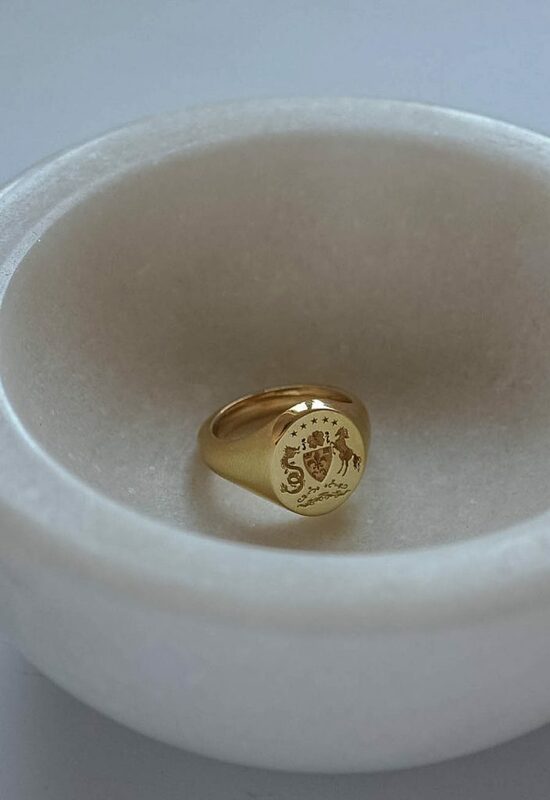 The signet ring’s association with power continued through the years. So much so, that by the Middle Ages Signet rings graced the fingers of any person of significant influence. Unlike today, this was for practicality reasons as the signet was used to stamp and sign all letters and legal documents. 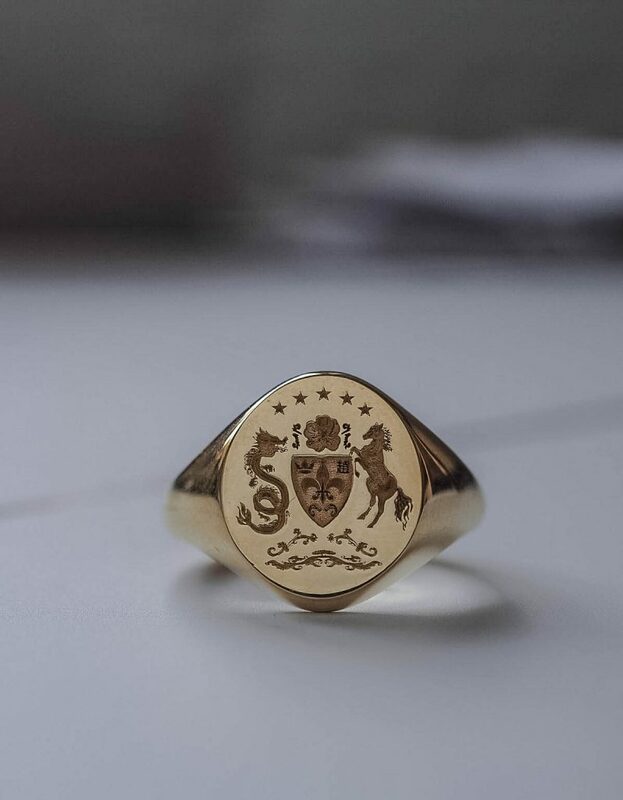 The metal embellishment of the coat of arms emblazoned on the signet ring would leave a permanent mark in any soft wax and place onto a variety of important historical documents. All rings were reverse engineered to ensure the intricate seal designs came out correctly when they stamped a document. 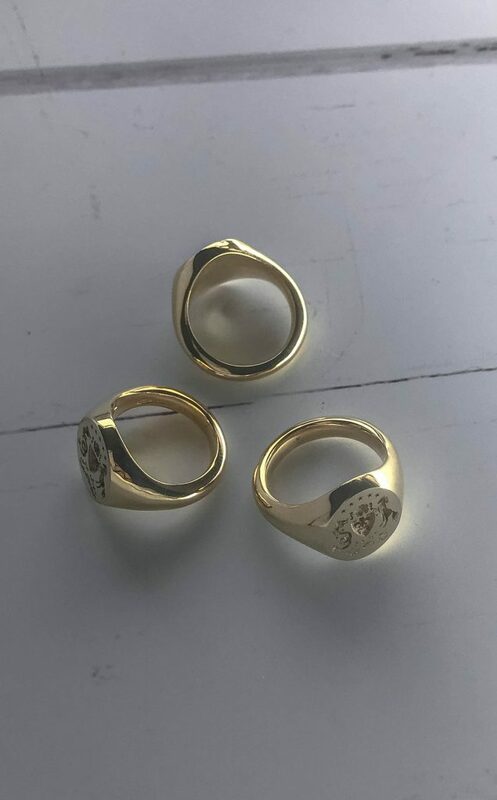 While Signet rings were worn from ancient times through to the early 19th century by Egyptian princesses and royal nobility, as more people became literate the use of signet rings as document seals began to decline. 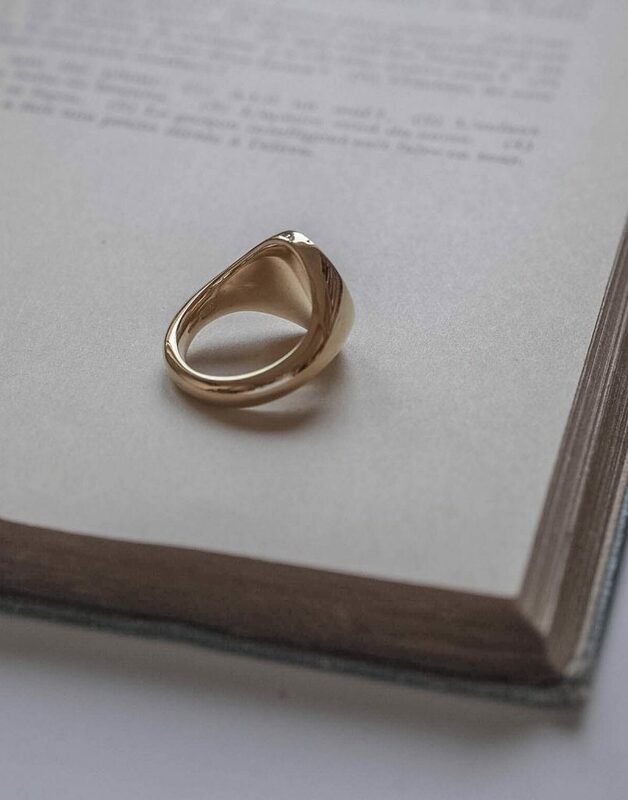 Gone away with the practical feature of the Signet, the ring shifted from being a legal mark and became more of a personal statement. More and more the Signets were beautifully engraved and became embellished with precious gemstones. 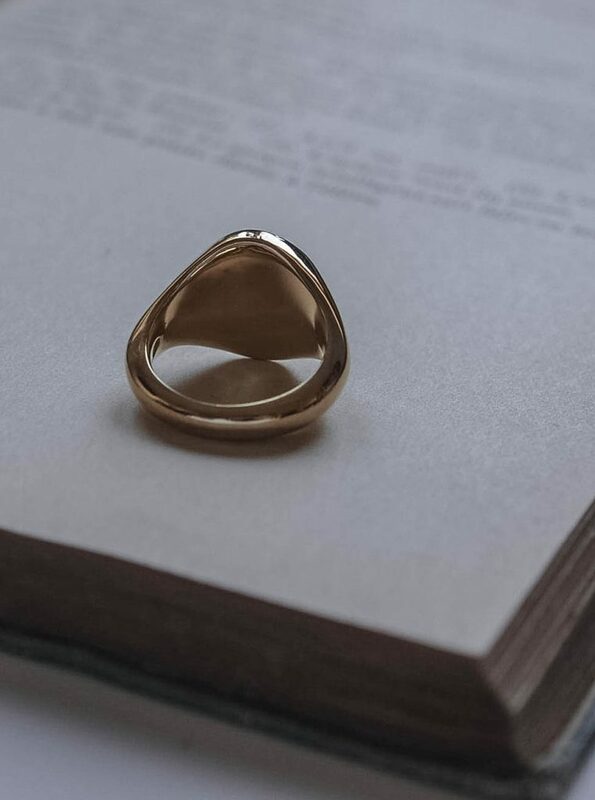 Today’s signet rings aren’t dissimilar to the historical style, with strong, bold curves in the design contrasting with the beautiful intricacies of the engraving. Worn as expressions of individuality, fashion statements and for some, continuing to wear the family heirlooms passed through the generations. 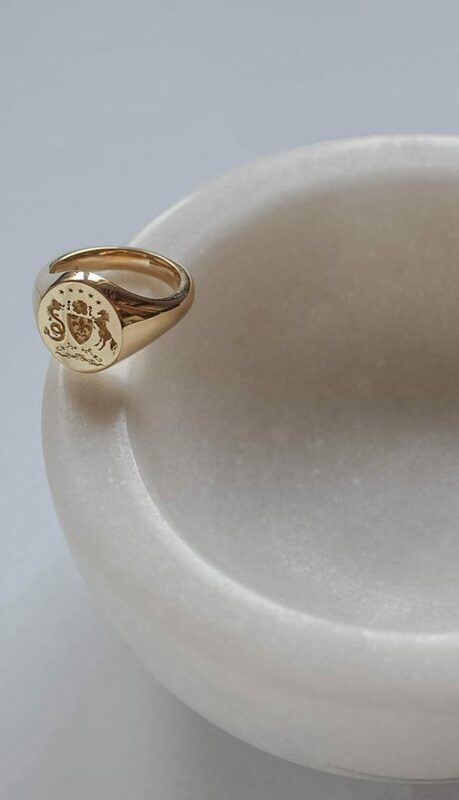 Many still embrace the personalised aspect of the Signet ring seen through the years, with many signets engraved with family crests or monogrammed with initials of loved ones. A practice that makes memories wearable. Here at Bianca Jones Jewellery, we love playing with classic jewellery norms. 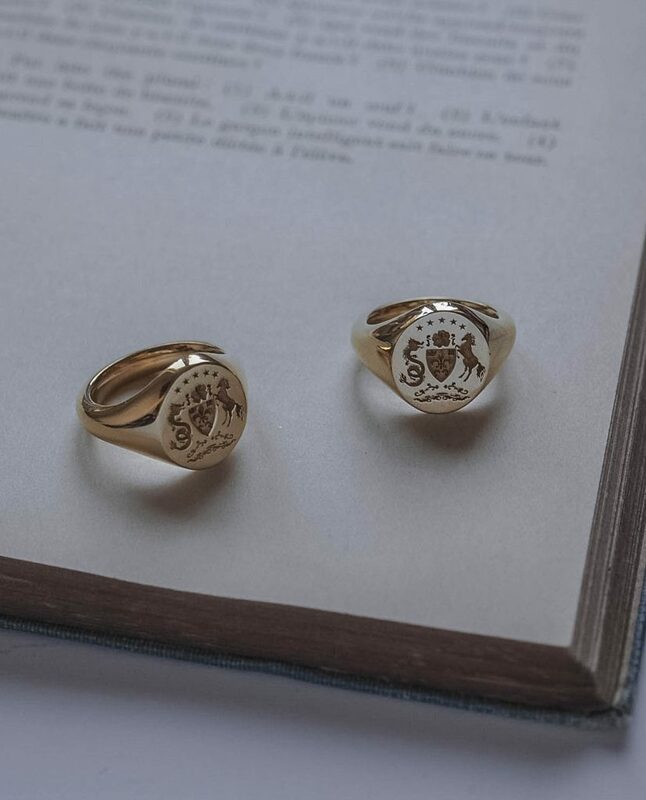 The alluring, if mysterious, designs of the Signet ring has always caught our attention, and the family tales and legends behind each symbolic crest has inspired us to adopt the classical style with a little stamp of today. So instead of using the signet as a seal of identification, make them your very own seal of your personality. A unique piece, all about you. Tell us a little bit about you, and together we can help you design and create your unique coat of arms, a hand and hand collaboration. Capture a little bit of your personality in your secret coat of arms. 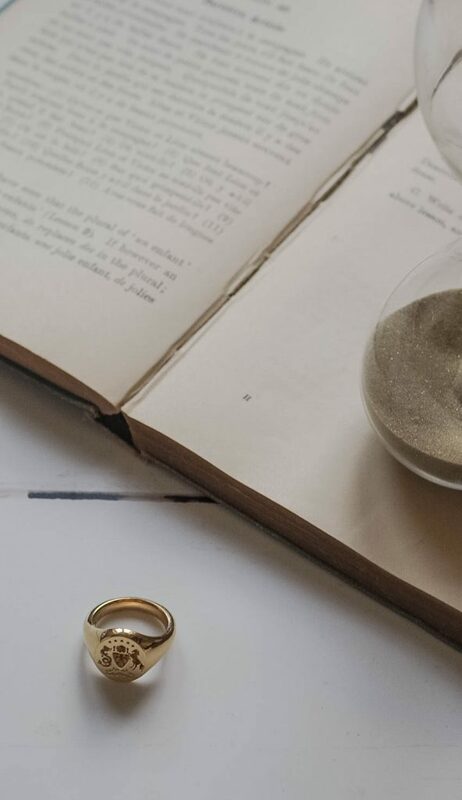 Perhaps you’re starting a family, and you want to create your family heirloom to be passed through the generations knowing it was designed and created by just you. 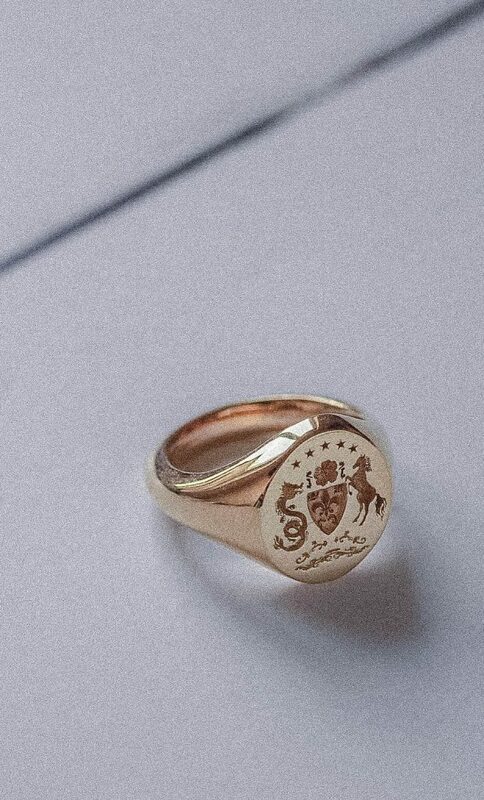 Love the idea of creating your very own symbolic coat of arms, but not so sure about a Signet ring? Well, fear not. Why not choose to wear your coat of arms engraved on a pendant to be carried around your neck always? Adapt that historical tradition with your modern view. Or perhaps treat your husband, boyfriend, partner to a set of cufflinks with a coat of arms symbolic of your love and unity. The options are endless, and we are more than happy to help you create a piece that suits just you. 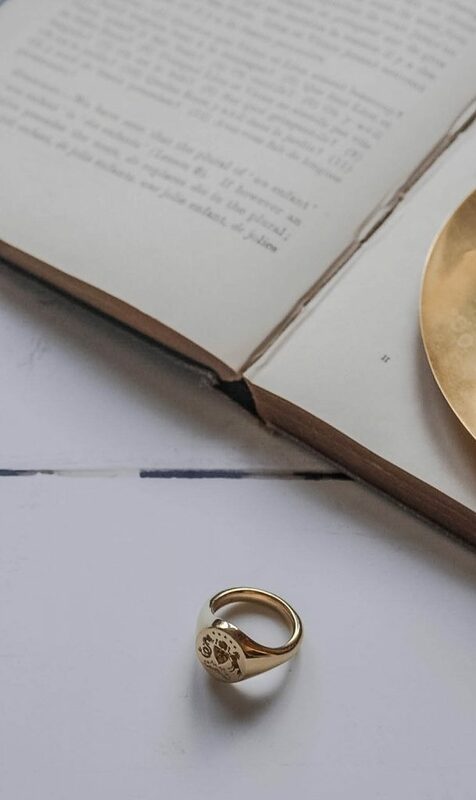 Create jewellery tokens that carry your seal of personality or love.